Edmonton's Commonwealth Stadium, in 2005. 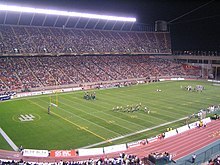 A Canadian Football League venue. 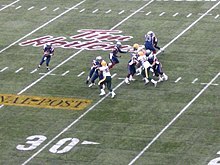 The Canadian football field is 150 yards (137 m) long and 65 yards (59 m) wide, within which the goal areas are 20 yards (18 m) deep, and the goal lines are 110 yards (101 m) apart. Weighted pylons are placed on the inside corner of the intersections of the goal lines and end lines. Including the endzones, the total area of the field is 87,750 square feet (8,152 m2). 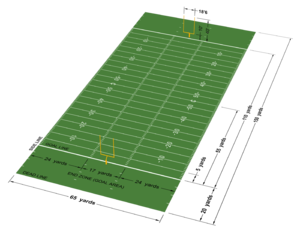 The sides of the field are marked by white sidelines, the goal line is marked in white or yellow, and white lines are drawn laterally across the field every 5 yards (4.6 m) from the goal line. These lateral lines are called "yard lines" and often marked with the distance in yards from and an arrow pointed toward the nearest goal line. In previous decades, arrows were not used and every yard line (in both multiples of 5 and 10) was usually marked with the distance to the goal line, including the goal line itself which was marked with either a "0" or "00"; in most stadiums today, only the yard markers in multiples of 10 are marked with numbers, with the goal line sometimes being marked with a "G". 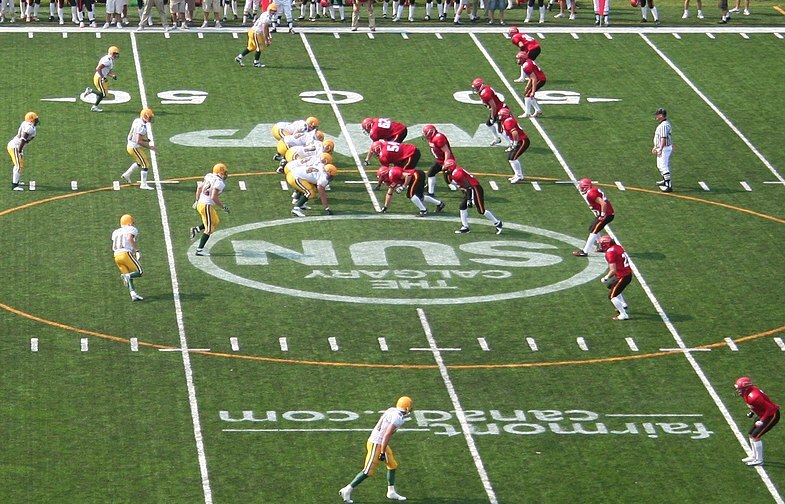 The centre (55-yard) line usually is marked with a "C" (or, more rarely, with a "55"). "Hash marks" are painted in white, parallel to the yardage lines, at 1 yard (0.9 m) intervals, 24 yards (21.9 m) from the sidelines. ^ a b c "Timeline 1860s". Official Site of the Canadian Football League. Canadian Football League. Archived from the original on 1 May 2010. Retrieved 13 July 2010. ^ Zelkovich, Chris (1 December 2009). "Grey Cup a ratings champion". The Toronto Star. Toronto, Ontario. Retrieved 23 December 2009. ^ "History". Football Canada. 2014-05-10. Retrieved 2018-09-21. ^ "Canadian Football League (CFL)". Encyclopædia Britannica. Retrieved 1 December 2014. ^ a b "History – CFL.ca – Official Site of the Canadian Football League". CFL.ca. Archived from the original on 9 November 2014. Retrieved 1 December 2014. ^ "Frequently Asked Questions about Game Rules and Regulations". Retrieved 4 June 2014. 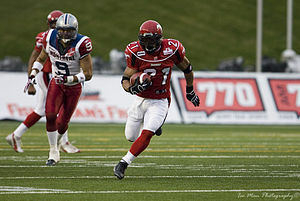 ^ "CFL introduces 4 rule changes for 2009 season". Canadian Broadcasting Company. 2009-05-11. Retrieved 13 July 2010. ^ "Major rule changes approved by CFL Governors". cfl.ca. 8 April 2015. ^ The Canadian Press (2010-04-14). "CFL approves rule requiring two-point convert attempts in OT". CTVglobemedia. Archived from the original on 2011-06-06. Retrieved 18 April 2010.